Drop tests are often used to examine a phone’s durability, I used a HTC Desire U to pick some mangoes a few days ago, but the phone was completely fine, the video will be out very soon. But you will be surprised to know that a smartphone can save someone’s life from a bullet. This time a real-world gunshot test proved the tough, rock solid built quality of a phone. Reports are that in what has apparently happened for the first time the budget-friendly Nokia Lumia 520 saved a polieman’s life by repelling a bullet. A Brazilian military police officer, with his Lumia 520 placed in his back pocket, was taking his uniform to his mother to be washed when he arrived he found his parents being held hostage. The two criminals after they saw his uniform, opened fire. The officer fled and would have taken a round in the behind if it wasn’t for his mobile deflecting the bullet,” reports Pocket-Lint. 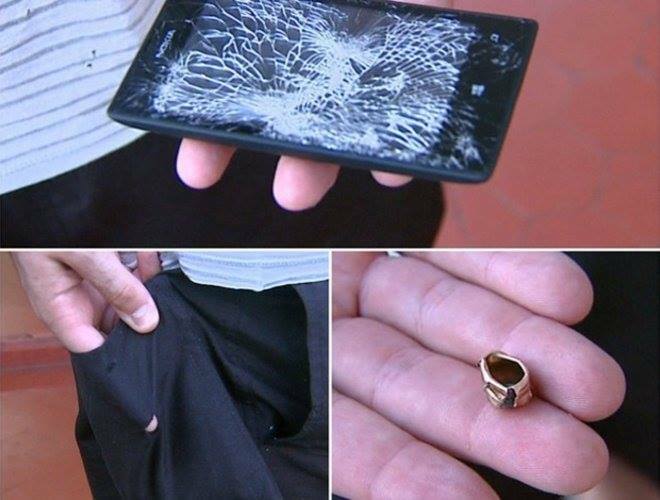 The phone deflected the bullet and got completely destroyed, leaving the officer totally fine. The criminals, however, managed to get away. And for the information of the readers, this post has been written and published on our site using my Nokia Lumia 520.